The Athena risk's management application provides clients with a global warning and crisis management service. Athena’s global travel risk management application that provides the latest risk overview and security updates and travel assistance for business and corporate travellers. It is a leading mobile communication platform that tracks personnel and delivers 24/7 instant assistance from Risk and Crisis Management specialists. The Athena App is supported by management platform. This platform is a dashboard configuration which allows the operator to effectively manage multiple App users globally. It has the function to invite users and activate new subscriptions to meet the needs of organisations continual tracking requirements. Management platform operators have the ability to access all country incidents and provide direct messaging and communications with app users this includes responding to SOS notifications and alerts. The management platform can be hosted and managed be either the client organisation or Athena Risk. Athena offers up to date security alerts across the globe that may cause issues with your travel or security. This platform provides all the required safety information about your destination including number of incidents, travel guides and entry requirements. This unique tracker pinpoints you within 20 metres and gives you the ability to request emergency assistance 24/7. The system allows your location to be continuously monitored and also allows you to share your location. Our app can be configured to work with the specific requirements of your organisation. Global distribution amongst your employees with multi language selection. The Athena App is supported by management platform. This platform is a dashboard configuration which allows the operator to effectively manage multiple App users globally. It has the function to invite users and activate new subscriptions to meet the needs of organisations continual tracking requirements. 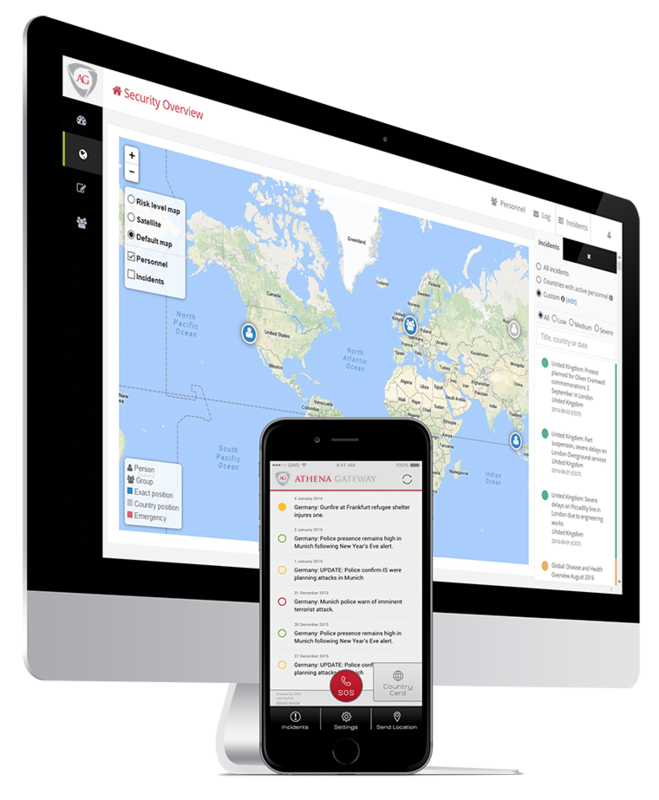 Management platform operators have the ability to access all country incidents and provide direct messaging and communications with app users this includes responding to SOS notifications and alerts. The management platform can be hosted and managed be either the client organisation or Athena Risk. An indispensable companion for anyone travelling globally who needs safety and security assistance. Dean of Glasgow Consular Corps and Honorary Consul of Mongolia in Scotland. I have used this app on numerous business trips around the world. I was immediately impressed by the ease of use, the detailed level of information pertaining to the country I was visiting and the location reporting facility. A very powerful travel app to keep to you safe and updated! Professor in Neuronal Dynamics, University of Newcastle upon Tyne.